The Border Collie has its origins in the border country between England and Scotland. It has been adopted as an Australian working dog because of its outstanding qualities as a sheepdog. All of today's registered Border Collies have been bred from the original working dogs. The first import of a Border Collie was Hindhope Jedi in 1901. When considering a dog please realise that you are taking it on for its lifetime. Border Collies live from between 12 to 14 years of age. The Border Collie is HIGHLY intelligent with an instinctive tendancy to work and is very responsive to training. If you are looking for a lazy, docile couch potato this is not the breed for you. These dogs make keen, alert, loyal and sensitive companions. As well as being loving family pets, they excel at obedience, agility and tracking, and make great sheepdogs as well as reasonably easy-care show dogs. Borders are very much people dogs and need much interaction with their family. This is not a dog to be left alone all day in the backyard all day with no company. The combination of brains and boredom can result in the dog finding something to do for amusement- which may not be amusing to you! Even if you want your dog purely as a famly pet, it is advisable to attend obedience school. A short training session each day gives your dog something to think about, reinforces your position as leader of the pack, focuses all your attention on your pet while strengthening the bond between you and your dog. 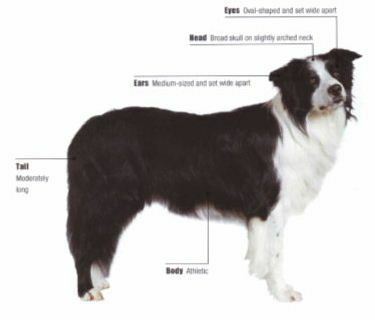 Border Collies are double-coated dogs with a short thick undercoat and a moderately long medium textured topcoat. They are easy to groom if cared for on a regular basis. Thorough combing and brushing weekly is needed to remove dead coat and to avoid problems when moulting. A well trained dog enjoys these grooming sessions as part of the quality time the two of you share together. If you are not prepared to exercise your Border Collie on a regular basis then this is not the dog for you. A walk each morning and evening is a prerequisite for keeping your Border fit, alert and happy. This is also a great time for socialisation with other humans and dogs and presents an ideal opportunity to learn road manners. As well as lots of love and attention, your Border Collie also needs training and discipline to ensure a smooth relationship between dog and owner. Note: Information between asterisks * is my own personal opinion taken from my own experience of over 15 years dealing with the breed. Other information has been supplied from ANKC literature.